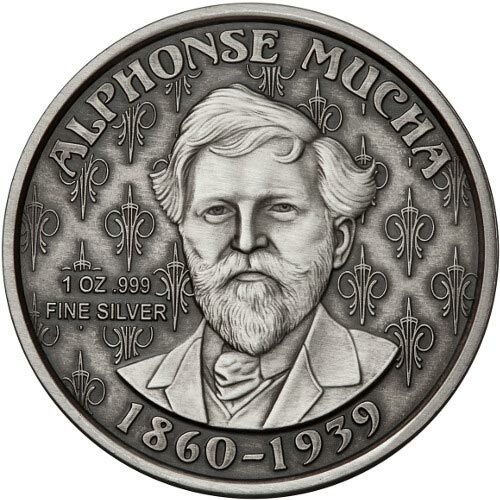 The Alphonse Mucha Collection from Anonymous Mint is a beautiful, diverse collection of silver rounds dedicated to many of the finest works of this Czech artist. Mucha was the founder of the art nouveau movement, and was responsible for many changes in the world of art, such as the wider availability of art for personal ownership among all classes of society. Right now, the 1 oz Antique Silver Mucha Collection Ivy Round is available to purchase online at Silver.com. Fifth design from the Mucha Collection from Anonymous Mint! Original artwork of Alphonse Mucha. Reverse features the image of Mucha. Obverse includes the artwork of Ivy. Each of the 1 oz Antique Silver Mucha Collection Ivy Rounds in this product listing ships to you inside of a protective plastic capsule. The individual silver rounds of this collection include a numbered Certificate of Authenticity, as well as edge lettering that denotes their serial number in the series and matches the COA. Ivy is the fifth design release of the Mucha Collection, and the image was created in 1901 by Mucha for the famed dancer Lygie. Many people have subsequently said that the image of Ivy was based upon Lygie herself. On the reverse of all Silver Mucha Collection Rounds includes a headshot portrait of Mucha taken from a real-life photograph of the Czech artist during the height of his works in the Art Nouveau period, from 1890 to 1910. Engravings include his name, year of birth and death, and the round’s weight, purity, and metal content. 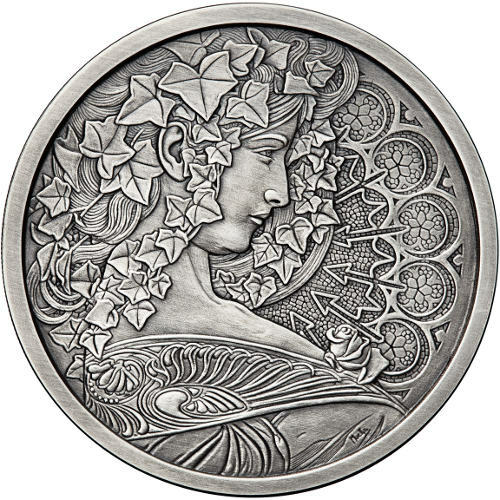 The obverse of the 1 oz Antique Silver Mucha Collection Ivy Round is the right-profile bust of Ivy. She is featured with full, flowing hair that is intertwined with ivy throughout, as well as a single rosebud placed at the forefront of her dress. The background elements consist of arrows and flowers in a well-arranged motif. All of The 1 oz Antique Silver Mucha Collection Ivy Rounds available to you here today have a wonderful antique patina that adds warmth and depth to the round’s design features, as well as its overall appearance. All rounds in this collection are from Anonymous Mint, which has the approval of the Mucha Foundation to reproduce his brilliant works through coin creator Julie Lindquist and Italian Master Sculptor Luigi Badia. If you have any questions, please don’t hesitate to ask. You can contact Silver.com at 888-989-7223, connect with us online using our live chat, or email us directly.